You'll love the Lindy's stainless steel loaf pan. Heavyweight material has even heat distribution and allows crusts to brown nicely crisp without burning. 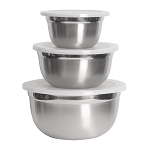 Highly polished mirror-like finish prevents crusts from sticking to the pan and makes cleanup easy. Can go from the freezer directly to the oven without damaging the pan. Doesn't tarnish and wear like aluminum so it always stays looking like new and will last for years. Spectacular quality!! Heavy duty, mirror finish, very handsome design. Awesome! The customer service is fabulous. One pan arrived with a dent that happened during shipping. The replacement pan arrived quickly. The pans are sturdy, with a beautiful mirror finish. My only negative comment is that the pan is not 100% symmetrical. It appears to be stamped "off angle". This does not affect the baking at all. And the price is right! This is a very sturdy pan that stays shining and easy to clean. I love it. I have not used this pan yet, but have no doubt that it will work out just fine. I ordered several other pieces which I have used many times and really have enjoyed them! This is a heavier guage stainless steel than the oblong baking pans, and I would say it’s probably about the same guage as the pie pans in this collection, which I love!